Master-made in Germany: Designed, patented and handmade by Munich-based master luthier Wolfgang Löffler, this high-end professional electric violin is a technical innovation and a sophisticated instrument that is ideal for professional performance. This electric violins decisive advantage is its pickup, which is not based on piezotechnology like other electric violins. Piezopickups usually produce an unsatisfactory sound, which is why this electric violin features two specially developed and directly integrated Viodukt Humbuckers. These electromagneticpickup systems were created in conjunction with the famous manufacturer Häussel Pickups, and they generate a highly authentic and lushsound full of timbre. Even at maximum volumes there are no ambient noises, undesired distortions or feedback. The hand-crafted Humbuckers are height-adjustable so that each string can be positioned individually as needed. Rich tonal variations are possible thanks to the excellent clarity of the signal: the integrated 18-combination processor and the optional hookup for effects generators of every kind make this electric violin a compelling and dependable musical partner for any musical genre. Classically trained musicians will also appreciate the familiar feeling it provides during playing as well as the electric violin’s natural and rapid response and the high craftsman standards which make Wolfgang Löffler’s e-Strings so remarkable. Every one of his instruments is produced by hand in his master atelier, and each reflects the customised work that honours the tradition of violin making in Mittenwald, which is where Wolfgang Löffler completed his training. All of the electric violin’s dimensions correspond to those of an acoustic, and the fingerboard of premium ebony and a maple body create classicalaccentsagainst the backdrop of a tasteful modern aesthetic. Depending on personal preferences, the electric violin can be played with or without the removable black carbon frame; its lines suggest the elegant curved silhouette of a violin corpus, and it is pleasantly light in weight. View below American Jazz violinist Edgar Gabriels ad-hoc Performance on our "e-Strings" electric violin. The electric violin’s fittings include a chin rest, shoulder rest and special steel strings by Pyramid – another component that was specially designed for Löffler e-Strings. We recommend this professional electric violin as an excellent instrument that makes a statement. 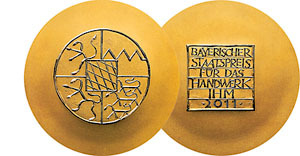 In 2011 Wolfgang Löffler was awarded the Bavarian State Prize for his work.